Spring parkway tree planting is underway. A total of 334 trees will be planted representing 33 different species, including seven unique oak species. Of the 334 trees, 13 are new tree plantings where there was no tree before, and the remaining 321 trees are placements for trees removed due to Emerald Ash Borer infestations, disease, decline or storm damage. Also, the Village will be honoring 148 specific tree species requests, which improve resident satisfaction and the likelihood of long­term tree survival. A TreeGator® will be made available free of charge for each newly planted parkway tree. 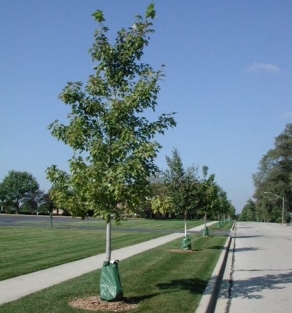 A TreeGator® is a 20 ­gallon plastic reservoir that attaches around the trunk of the tree. The TreeGator® is quickly and easily filled twice a week with a garden hose, and the small holes in the bottom allow water to trickle out slowly. This encourages deep root growth. For more than a decade, TreeGators® have improved tree survival and simplified tree care. Shown in the picture are trees planted along 67th Street which have grown and flourished since their planting in 2005.